Only the sharpest razors are suitable for fine precision cutting or personal shaving. 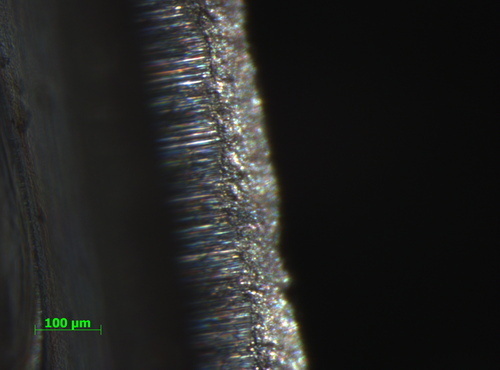 To see the quality of different razor blades, Johnson magnified his samples showing in his legend the distance of 100 microns, the width of one average facial hair. Johnson was looking to see if “there really is a difference between sharp and really sharp,” while also keeping in mind the importance of how long a blade will hold its edge. Furthermore, when looking at razor blades for industrial uses, some customers request a blade to be double honed, or extra sharp, while others need thicker blades for heavy duty cuts. 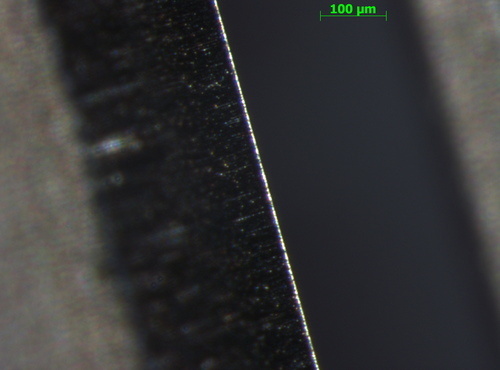 These thicker blades can also be extra sharp and should not look jagged under a microscope, however, they still maintain a quality edge. In the end it comes down to the quality of manufacture. A quality razor blade will have a sharp edge from the outset and will stay sharp longer than other equivalent blades. After his examination of various razors’ edges, Johnson argues, “all razors are by their very nature pretty much the same, right down to the edge.” Why sacrifice on the most important feature of a product? Here at The Razor Blade Co. we don’t believe you have to choose between cost and quality. We handpick only the best razor blades with proven success and quality for you and your customers. Don’t believe us? Pull out a microscope and see for yourself!